The other day I decided to switch up my Sausage and Potatoes dish with a new twist. I had some boneless chicken breasts waiting to be used and thought about what I could make with them. I threw them all together with the sausage, potatoes, onions, and then added some roasted red peppers to the mix. The final result was something my family truly enjoyed and a definite keeper. You will want to start the recipe a few hours before you are ready to bake it. Overnight would work too. Begin cutting up the chicken breasts into equal bite size pieces. Place the chicken in a large Ziploc bag. Slice the roasted red peppers into strips and add this to the chicken. To the chicken peppers, add olive oil, garlic, onion, basil and the roasted red peppers. Allow to marinate for a minimum of 3 hours, or overnight. When you are ready to bake, heat the oven to 350 degrees. Leaving the skin on, cut each potato into equal size pieces and add to a large bowl and add salt and pepper to taste. Cut each sausage link into 3 pieces and add it to the potatoes. 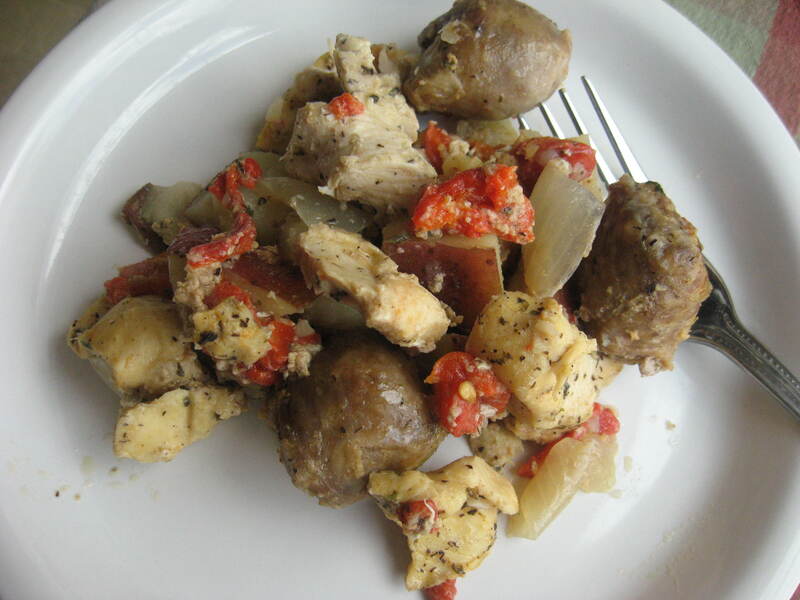 Dump in the entire contents of the chicken mixture to the potatoes and sausage and mix well. 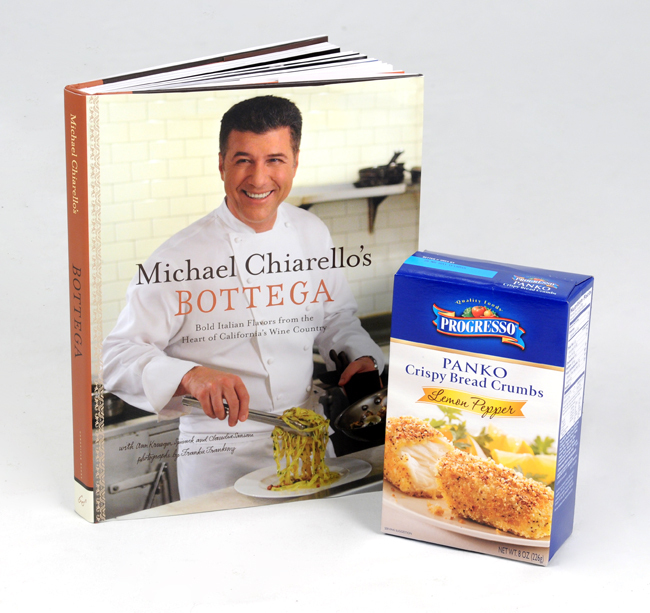 Add the entire mixture to a 13″ x 9″ baking dish and cover with foil. Bake for one hour. After an hour, turn the oven to 400 degrees and remove the foil. Allow to continue cooking, stirring occasionally, until the sausage browns somewhat. Once done, remove from oven and enjoy. This is a super easy one pot meal to make for your family. My daughter looked and said she wasn’t eating it until I had to tell her it was “Cinderella Pasta”. When she asked why it was Cinderella’s Pasta I told her because the wheels in the pasta came from Cinderella’s pumpkin coach. I was grasping at straws to try to get her to try it and I knew once she did she would like it. Really, it’s more of a ragu than it is Cinderella’s anything. 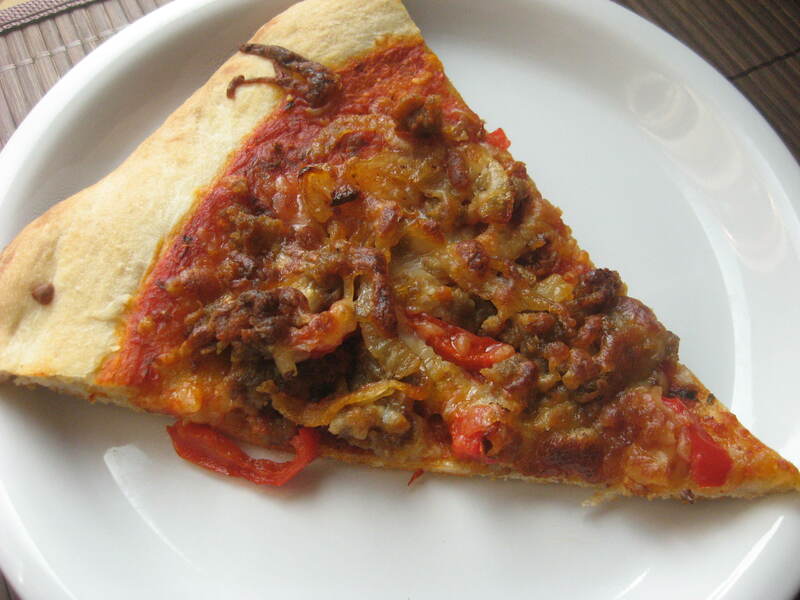 I made this with diced tomatoes, bulk Italian sausage and ground beef. Let the ragu simmer on the stove while you boil the pasta water and you have a filling meal ready in no time. And, okay, I actually used two pots, but one had boiling water in it so I’m not counting it. 1/2 lb. 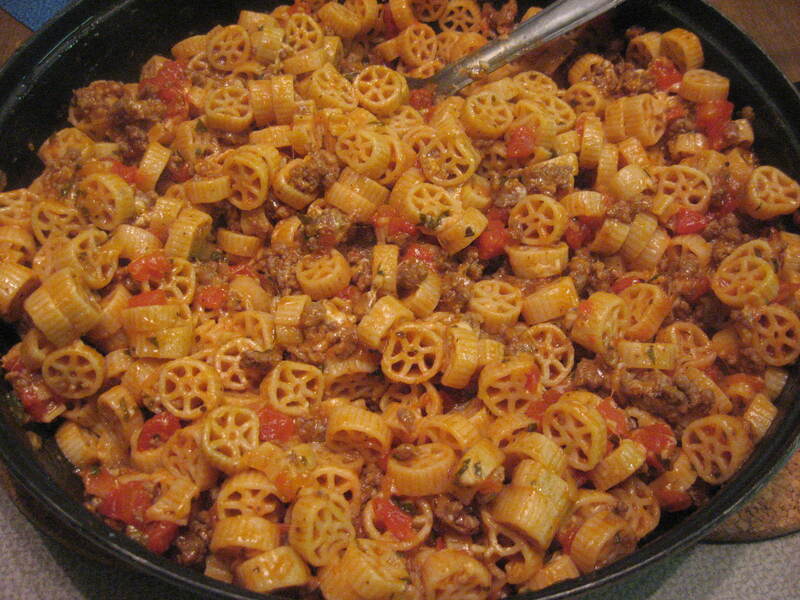 Pasta such as Wheels, Penne, Bow Ties, etc. In a large and deep skillet, brown the pork and beef breaking up as it browns. Remove it to a paper towel lined plate to drain. Without washing the skillet, add the onion and garlic and sauté until translucent. Add the meat and all other ingredients to the skillet except for the pasta and the mozzarella cheese. Stir together well, cover and reduce to a low simmer. Fill a large stock pot 3/4 with water and salt. Bring to a boil. Add the pasta and cook until just al dente. Once done, drain the pasta, add to the skillet along with the mozzarella cheese and stir well. Serve with garlic bread. Check it out here for more great recipes! I learned early on in my marriage that one of my husband’s favorite dishes was Chicken Cordon Bleu. I also learned early on that it’s a pain in the neck to make. Getting everything rolled up inside the chicken just perfectly, making sure to bread it fully so that everything doesn’t seep out. After awhile I just didn’t make it anymore. A few years ago I came up with the idea of making it easier. I had boneless chicken breasts, swiss cheese and ham in the fridge and asked myself why it had to be “inside” the chicken instead of on top of the chicken. So I made it that way, it took minutes to do and tasted just as good, if not better. In fact the chicken being cooked in a thin layer made it not only easier but kept the chicken more moist. Give this a try on a night when you are pressed for time and want something delicious but easy! 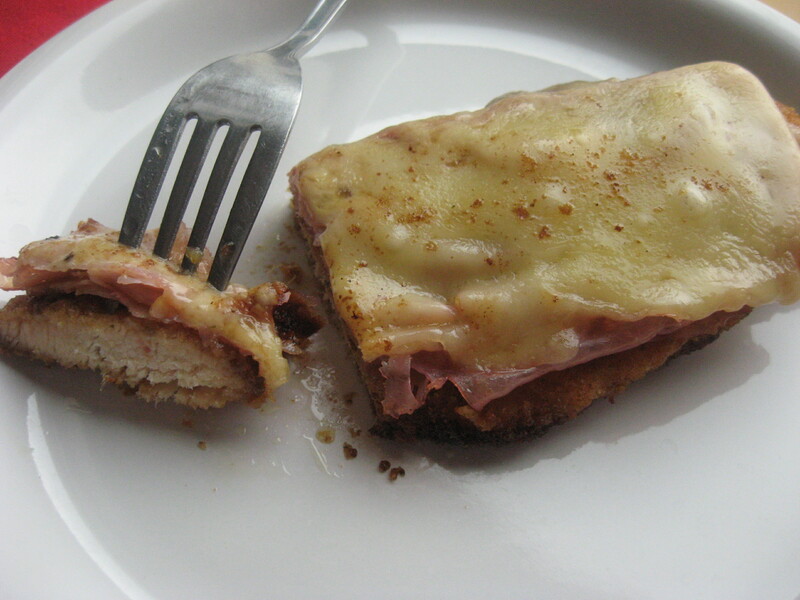 CHICKEN CORDON BLEU – INSIDE OUT! 4 Boneless, skinless chicken breasts, trimmed of all fat and filet so that you end up with 8 pieces of chicken. Set up your station to dip and coat your chicken breasts. Add two eggs to a shallow pie pan and the milk. Beat together until well blended. Trim chicken breast of all fat, then filet so you have 8 pieces of chicken. Season chicken with salt and pepper. 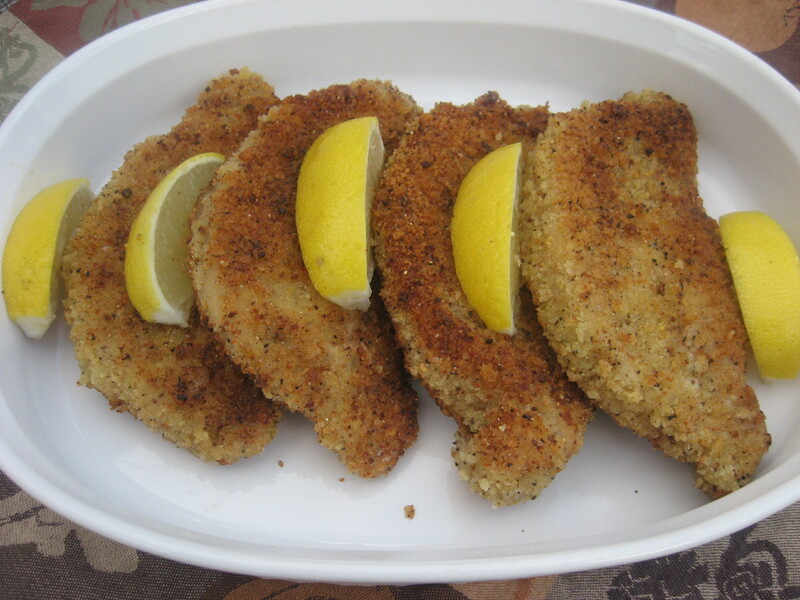 Dip each chicken breast in the egg/milk mixture, than coat in the breadcrumbs. In a large skillet heat a few tablespoons of olive oil. Once hot, begin browning the coated chicken breasts. Do this in batches of three or four at a time. Once you have some nice browning happening, remove from the pan and place in a large casserole dish in a single layer. I used a 13″ x 9″ baking dish. Place in a hot oven, uncovered, and allow to bake for 15 minutes, or until you are sure the chicken is fully cooked. If the breasts are no more than 1″ thick you should be able to achieve this in 15 minutes. Remove from oven and place a piece of ham and top with a piece of swiss cheese. Return to the oven uncovered and allow to bake until the cheese is melted.